A storm of pointing fingers swept the world in 1993 as Optimality Theory (OT) rapidly became the 'mainstream' theory of phonological computations, a position it was to occupy for many years thereafter. 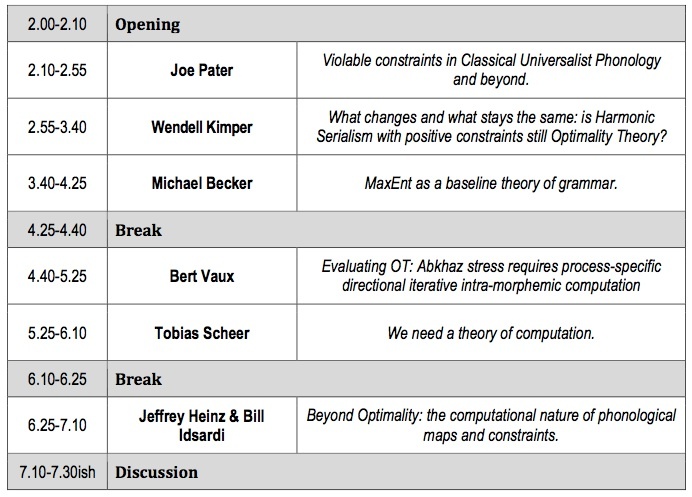 We now seem to have reached a stage where many properties of OT as a formal theory are known: we have fairly well worked-out models of how OT grammars can be acquired, and how they can predict typologies. We also know that OT can be combined with a wide variety of theories of phonological representations, and that much depends on what would be a theory of possible constraints, although there is no consensus on what such a theory would look like. It is our impression, however, that interest in OT has been diminishing lately while no single alternative seems to be occupying its former position as the mainstream theory of phonological computations. Recent years have witnessed a great deal of work on constraint-based approaches to phonological computation belonging to the same broad family as OT: Harmonic Serialism, Harmonic Grammar, Serial Harmonic Grammar, etc. At the same time, much ongoing work on topics such as phonological representations, the interactions of phonology with other components of grammar, variation, and learning biases is no longer automatically framed in optimality-theoretic terms (or continues in frameworks unconnected to OT). A part of the phonological community thus seems to be abandoning OT precisely at a time when its properties have become well understood, but the reasons for this decision and for its timing are not immediately apparent. In this fringe workshop, we want to take stock. Where are we with OT today? Which of the ideas in the framework continue to inspire research and are still important for the future? Which aspects of the theory have turned out to be so problematic that they really need repair? Is there still going to be OT in 20 years from now? The full version of the plan for the workshop, with abstracts from the speakers, is available here. The plan aims to incorporate time for contributions from the audience, and from two discussants: Ricardo Bermudez-Otero and Marc van Oostendorp. The discussants will get the first comment or question after each speaker. It is free to attend the workshop, and no registration is necessary - you can simply turn up on the day. The workshop will be held in a room at the University of Manchester, which is close to Hulme Hall (where the mfm will be held), but not quite in the same place - Hulme Hall is about ten minutes' walk away. This page is hosted by Linguistics and English Language at the University of Edinburgh; last updated in April 2015.